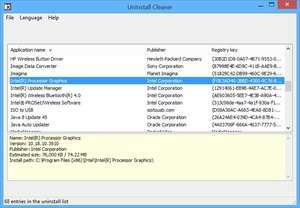 UnInstaller Cleaner is a very basic and helpful free tool which can help you out when it comes to cleaning up the "Add/Remove Programs" interface in Windows. Quite often software installations might not fully complete their job or "forget" to remove themselves from the list of installed programs. This can be both frustrating and annoying for anybody who likes to keep track of what's what on the PC. As a portable application, UnInstall Cleaner itself doesn't cause any of the programs it solves. For security reasons, you should also check out the UnInstall Cleaner download at LO4D.com which includes virus and malware tests. Additional screenshots of this application download may be available, too.